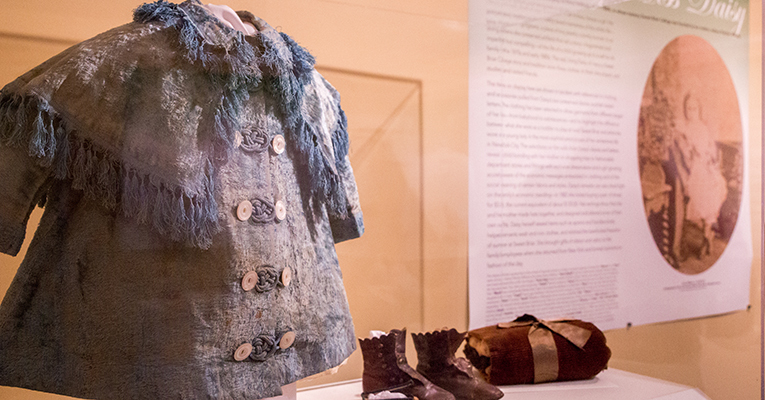 A tiny coat and shoes are among the items on display in “Dressing Miss Daisy,” a new exhibit in the Sweet Briar Museum’s Whitley Gallery. 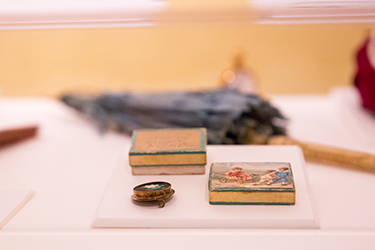 A new exhibit in the Sweet Briar Museum’s Whitley Gallery offers an intimate view of a genteel life in the late 19th century — and brings to vivid life a character who sometimes seems more fabled than real. “Dressing Miss Daisy” opens Wednesday, Jan. 18, with a reception of light refreshments at 4:15 p.m. The show is an outgrowth of senior Jade Smith’s ambitions for a marketing career with a major fashion company. Smith is a business major from Lynchburg working toward her Arts Management Certificate as part of her plan to get there. For her arts management practicum project in the fall, Smith co-curated the exhibit with museum and art galleries director Karol Lawson. It displays and interprets clothing and accessories belonging to Daisy Williams (1867-1884) — whose mother founded Sweet Briar in her memory. The show was inspired by research Smith completed for a spring 2016 museum studies class. There are 28 items displayed along with interpretive texts that include excerpts from Daisy’s diaries and letters written in 1882 and 1883. A period map, glossary and lists of venues and names explain the many references in her writing to New York department stores, boutiques and dressmakers. Some, such as Macy’s and Lord & Taylor, are still around today. Lawson suspects that one or two of the artifacts are mentioned in the texts, including a striped dress shown prominently in the exhibit. Daisy Williams’ mention of a mosaic pin in her diary in 1880 may be a reference to this one. Because Indiana, a grief-stricken mother, preserved so many of Daisy’s things, it’s easy to trace her progression from little girl to teenager. That’s true of her commentary, too, as she moves from delighting in pretty clothes to pointed opinions about fashion. Her writings are full of details of her daily activities and clothing — both hers and others. In November that year, on a return trip, she again writes to Taylor, noting New York women are donning furs and winter cloaks. “The style is to wear a little stuffed bird on your hat, but I do not like it, as I always think how cruel it is to kill them,” she wrote. Smith’s goal was to “show and tell Daisy’s personality” and that of the time period through her clothing and style choices. “The ‘easiest’ part and also the most fun was doing the research about how clothing played such a major part in society during the eighteen-hundreds and what it could tell about a person, their status in the community and sometimes their own personal beliefs. Another fun part was looking through all the clothes!” Smith says. Deciding what to include and putting it together to create the exhibit was the hard part. Discovering what a museum curator actually does was a revelation. Smith embraced the role, Lawson says. It’s not simply choosing what you’d like to display, she explains. There’s a process of determining if an item’s physical condition allows it to be viewed safely, researching it, then deciding whether and how it tells a story. 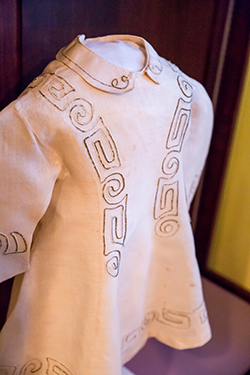 A linen dress with velvet soutache braid decoration is in remarkably good condition for being roughly 147 years old. Smith’s research on Daisy’s brown jacket in the previous semester’s museum studies class gave Lawson the idea for the exhibit, which she then suggested as her practicum project. Lawson sees the project as a true collaboration between student and professor and an exemplar of classroom theory and experiential learning coming together. Smith’s obvious enjoyment of the work — even during its tedious moments — lifted her own appreciation of it as well, Lawson says. The exhibit also created opportunities for Abigail Schutte and Grace Culley, both senior art history majors, to help with the installation as work-study assistants. Now, Smith is looking ahead to taking Business Seminar I this semester, another class that requires students to apply theory in practice. “I’m really excited to see how I can blend what I learned during this project — the creative aspect — with the literal business side of things,” she says. After graduation, she hopes to study for a master’s in luxury brand marketing and management in France. It’s all part of her plan. The exhibit will be on view through Nov. 17. Museum hours are 1 to 4 p.m. Tuesday, Wednesday and Thursday during the academic year. The museum is closed when the College is not in session. Tours are available by appointment. 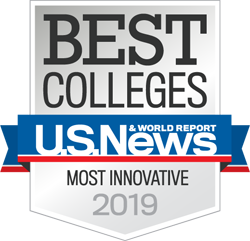 Contact Lawson at klawson@sbc.edu or (434) 381-6248 to schedule a tour or for more information. Admission and tours are free.